I'm working on an article idea at the moment, premise being real weapons used in war that were so unfairly ahead of their time or well-engineered that they could be comically considered 'cheating'. I was wondering if you all had any examples you could throw out. I have one right now that when I first came across it seemed like fiction. The Paris Gun- First used in 1918, the Paris Gun was so known for being able to shoot from German encampments at the edge of France into the city of Paris. With a barrel 36 meters in length, the Paris gun could elevate a round over 40km in altitude with a lateral travel distance of around 120 km (75 mi)! It was thus the first artillery piece to send its projectiles onto enemy targets from the stratosphere. The gun was intended as a psychological weapon, for its unprecedented range made it so that when Parisians were first fired upon they believed they were being bombed by unseen zeppelins. The gun was responsible for killing 250 people and wounding 620. I'm also considering using the XM25 CDTE, which is an airburst rifle currently being shopped by the US army. The gun's built-in laser range finder and the adjustable detonation distance of its projectiles essentially make cover negligible. I've played around with it in an simulator and it is frightening. Was it better when we had wars with swords? Why is my New Theory in this section? I'm working on an article idea at the moment, premise being real weapons used in war that were so unfairly ahead of their time or well-engineered that they could be comically considered 'cheating'. I think what's comical is the idea of cheating applied to war. sculptor, Bad Robot and TheUnknowable like this. Wikipedia has separate articles for IED's, booby traps and land mines, yet yesteryear's IED's and booby traps are today's land mines. Go figure. The use of IED's goes back several hundred years, and Confederate soldiers used the concept in the American Civil War by burying explosive artillery shells under the threshold of abandoned houses and under the approaches to bridges. IEDs are gurrila weapons, though not unfairly powerful. I'd like to nominate the Atom bomb. When you can force your enemy's surrender by dropping two bombs during suicide missions, the weapons are a bit outrageous. Neither Hiroshima or Nagasaki were suicide missions. Both crews returned safely. Greek fire, Ferguson Rifle, Volcanic Rifle, Black Powder "Ancient China", 1879 Lee Rifle, Fedorov Avdomat, German V2 missile, Tiger 2 "until air support/anti-armor guns/mildly rigid terrain stopped them", Maxim Machine Gun, Gatling Gun, Korean Iron Clad Turtle Ships, German ME262 and HE162 "Had their disadvantages", Trap-door rifle "scarcely used in civil war", Phalanx Formation, Kentucky Long Rifle, English Long Bow. The list goes on, but you get a basic idea, have fun looking those up. jrmonroe and cono78 like this. That's Fedorov Avtomat ("t" not "d"), Me 262 and He 162 (both lower-case "e"). Although the Volksjager was more of a cheat for the Allies - a very hot jet exhaust playing over a wooden empennage is rather stupid, and the Federov wasn't so much a cheat as ahead of its time. Wearing the enemy's uniform, using their language & routine to infiltrate enemy positions....a la Otto Skorzeny's specially trained unit in WWII. I think that's a good way to cheat although it is war and win at any cost is the spoken mantra. How about we all dress up in red and form a line in front enemy then walk towards them firing as we go? Would that be the way to fight fair. Apparently the stupid British redcoats thought so. But damn! The enemy cheated the hide behind trees and rocks and in fox holes and fired at the British. How uncivilized and unfair. The lines where necessary get mass fire...it was very effective. We were't able to win many battles until we learned and adopted those same tactics--(the battle for Boston was an exception won by massed artillery well defended on a hillside). Also the brits used just as much unconventional tactics for a variety of missions as much if not more than the Americans. I fear you've been misled and misinformed by popular grade school misconceptions about the American Revolution. It may have been a useful tactic, but they used it longer than it was useful. A couple of interesting SF stories by Donald Kingbury (Courtship Rites aka Geta and The Moon Goddess and the Son) in part explored the historical race between weapons/military technologies, and the cycle of increasingly expensive military elites being brought low by peasant armies using new low cost technologies. I suppose the most celebrated was the English Longbow, that let peasant archers take down the expensively armored professional elite soldiers. I think there was also a battle where armored knights were knocked off their horses with heavy hammers by peasant soldiers then killed like upturned turtles, with knives through the gaps. Plenty of examples of 'cheating' - if winning against the odds can be called cheating. Well, that is probably a matter of which side, too; our own side is innovative, enemies cheat. But the original question brings modern warfare, as practiced by the US and it's allies to mind; if there were ever cases where one side outguns their enemies it's been the recent wars in Afghanistan and Iraq. By the time troops landed the defenders had second and third rate weapons, no satellites or air surveillance, no air support, no naval support, no way to stop 'conventional' aircraft let alone stealthed ones. And crucially no way to take the battles outside their own borders except by covert means (when done by 'our side' that's legitimate, but by the other side it's terrorism or cheating), let alone prosecute them on their enemy's (US) territory. Yet I'm not sure anyone categorize either as easy or low cost victories. Never any chance that the US led side could lose, but, depending on what you think the aim was, they are hard to describe as victories. Should some cheap Surface to Air weapons emerge that can take reliably take out stealthed and unstealthed aircraft, we could see a repeat of the way Afghani's took out Russian helicopters and planes with US supplied weapons and changed the balance during that invasion. It was not only useful in the late 18th century...it was absolutely necessary to get mass fire and used by every large military in the world including the Continental Army after learning it Valley Forge. Volley fire really didn't loose its effectiveness until the mid-19th century, due to more rifled weapons with better range, accurate artillery fire and the invention of Gatling and other rapid fire weapons that could mow down large formations in the open at range. The premise of the thread is pretty silly. The art of war is about achieving victory, mostly by crushing the will to fight of the enemy, without losses on your own side--there is no such thing as cheating. How can you CHEAT in a WAR with Weapons? This makes ZERO sense. It is war. Hi some of the others are suggesting that the idea of 'cheating' seems a little silly or at least strange when applied to war, this is perhaps because the objective of war usually is just to win. So perhaps we could rephrase what you are suggesting to 'gave one side a significant tactical advantage over another' instead. To this end I think there have been many decisive weapons that have done this throughout history, perhaps the single most striking example would have to be the development of the Atom Bomb. In 1945 the Japanese had no way of stopping or defending against a nuclear attack, it ended their will to fight after only the second such strike, surely there has never been such a more clear tactical advantage given by a single type of weapon to one side over another. But other notable examples include the tank, when the British first introduced this monster to the battlefields during the first world war the Germans had never seen anything like it and though the early models were slow and unreliable the Germans had no real defence against it. This at a time when cavalry was still being used! Another example of a weapon that gave one side a serious tactical advantage is the German V2 rocket. It was ensentially the worlds first ballistic missile and could be fired from great distances, it was also nearly impossible to shoot down because of the speed at which it travelled, luckily for the allies the war ended before the Nazi's could strategically utilize this weapon. shoot down because of the speed at which it travelled, luckily for the allies the war ended before the Nazi's could strategically utilize this weapon. The V2 was used strategically, ask any Londoner - or the relatives of the servicemen who died in Belgium. It was also a resource-hungry monster that was ineffective, inaccurate and cost more to implement as a "system" than any damage it did. The V2's only "saving grace" was that it led the way to "bigger and better" things. Perhaps, I didn't quite make my meaning here clear, the V2 rocket was designed as a "Vengeance" weapon. It was used to create fear and panic and used primarily against civillian targets. It was never used as a 'strategic' weapon to stop the allies recapturing Western Europe. If the V2's that were fired at cities like London had been used to attack strategic millitary targets such as the ships bringing the allied invasion on D day the effect could have been truely disastrous to the war effort. Also if the Nazi's had managed to build enough and in time they may have even been deverstating enough to turn back the Russian invasion, however the Nazi's never managed to use them in this way. If the V2's that were fired at cities like London had been used to attack strategic millitary targets such as the ships bringing the allied invasion on D day the effect could have been truely disastrous to the war effort. A V-2 warhead was 1 tonne - less than the average fighter-bomber, let alone strategic (or tactical) bomber of the period, and, as a programme, vastly more expensive 1. I'd say that a Soviet Katyusha was far more cost-effective. As for targeting ships (or even beaches) don't forget that the "accuracy" of the V-2 was such that they managed to miss London as often as not. 1 Overall the V-1 & V-2 programmes cost more than the Manhattan project (3 billion dollars!) and V-2s cost as much as a Pzkpfw IV each (for a one-shot weapon). I too find the odd mixing and understanding of strategic and tactics--if you are hitting a distant civilian population, it is almost always strategic (cross border terror attacks are strategic--as was the attack on Hiroshima). Tactics is the conduct of an individual battle. Strategy is the conduct of a campaign or entire war. Hence cross-border attacks, and Hiroshima, (while being tactical actions in and of themselves 1) are/ were a result of an overall strategy 2. The longer-range (spatially or temporally) any particular action is the more likely it is to be an essential integral part of the over-riding strategy. PS despite popular usage a chess game is tactical - it's a limited one-off encounter, with a constrained physical (geographical) boundary and fixed, pre-assigned, forces. 1 Short-range goal: Kill the enemy in a particular location & drop the bomb on that city, respectively. 2 Long-range goal: concentrate the enemy's attention/ tie up a portion of his forces at one position while pursuing an objective elsewhere & hasten the end of the war. I thought tactical implied against the opposing army while strategic implied against the ability to raise or support an army: bombing a barracks would be tactical while bombing a damn to flood a tank producing town would be strategic? I think strategic is a way of describing an action or thing that contributes to the overall stratergy, whilst tactical relates more closely to an individual element or tactic used within a stratergy. This being said sometimes people do interchange tactic and stratergy as synonyms though not strictly correct. Yes I would certainly support that, but perhaps also to note though whilst you rightly point out the V2 wasn't ideal during the second world war as a weapon to give strategic military advantage it should also be understood that the Nazi's were also working on developing a nuclear weapon. If they had actually succeeded and used such a weapon in conjuction with the V2 they would have been virtually unstopable. Nuclear armed ballistic missiles form the bulk of, and are now in service by every major Nuclear power on Earth as their ultimate deterents. So surely such weapons in the hands of the Nazi's would have move certainly given a seriously unfair military advantage over every other nation, had indeed they have been allowed to actually finish developing them. As it was they were never allowed to complete their ultimate aim to have nuclear armed ballistic missiles, so they didn't ever manage to use the V2 in such a way as to give them such a clear strategic military advantage of any real significance as the actual outcome of the war indeed demonstrates. it should also be understood that the Nazi's were also working on developing a nuclear weapon. If they had actually succeeded and used such a weapon in conjuction with the V2 they would have been virtually unstopable. It's contentious as to whether they actually were working on a nuke (for one thing nuclear weapons rely on "Jewish science", which the Nazis had rejected 1), or at least how serious they were about it; and if they were, how far along they got 2. Plus, fitting one, if they HAD succeeded, into a V-2 would have been problematic at best. 1 Which explains, at least in part, why they went for looked to crank options like Schauberger's "implosion energy" among others. 2 This subject too is subject to much, er, uninformed speculation by the Nazi Flying Saucer Nuts and the like. Well it's certainly open to speculation just how far along with creating a nuclear weapon the Nazi's actually were at any stage, but it was something they definitely were working towards, numerous accounts have been recorded of allied missions to stop or restrict the Nazi ability to produce heavy water of which the allies believed was to be used in making an atomic weapon. The film is based on an actual operation in Norway to attack a Nazi heavy water plant. They were definitely working towards a reactor, but the whole thing (3 differing projects) was "put on the back burner" because it was assessed that nuclear fission would not contribute significantly to ending the war. IOW any actual weapon research was on a "go slow" and not a major programme, because, to a large extent most German scientists involved were of the opinion that a nuclear bomb was years away and possibly impractical 1. 1 There were reports (captured scientists in post-war interrogation) that they over estimated the amount of material required by at least an order of magnitude, making a weapon unfeasible. Extract: "During World War II, Germany worked to develop nuclear weapons, though Allied scientists ultimately beat the Germans to this goal"
You do realise that the quote/ link I gave comes directly from a link given on the page just after your quote, don't you? In other words: it would have been a dangerous weapon if the Nazis had been able to give it a guidance system. But computers were still in the very early design phase at that time. Huge, monstrous contraptions composed of vacuum tubes, with switches that had to be manually adjusted. The best you could hope would be to make it remote-controlled by a human operator. But that operator would need to be on the ground near its target to be of any use. And they'd need to be really skillful, with lightning fast reflexes. Yeah. That's one of the main reasons the American Civil War was such a blood bath, isn't it? Commanders being slow to change over to newer tactics instead of pitched battles. I've heard that sometimes civilians would sit on the hills nearby and watch the battles. This might be debatable in some ways. Think about the first gulf war. It was over really quick. The soldiers on the ground spent most of their time accepting mass surrenders. However, it really didn't settle anything. Most of the engagements where the USA just drops a bunch of bombs, but doesn't put troops on the ground end up the same that way. We kill large numbers of enemy soldiers, while losing very few or none of ours, but if anything, the enemy ends up respecting us less, and caving to us only at the bare limit of whatever treaties they've signed. Contrast that against a war like Afghanistan or Iraq #2, where we lose a lot our own soldiers fighting man to man, spend a long time, and hold on to accomplish specific objectives before ultimately pulling out - and I'd have to say the result ends up being a lot more final. Just to be picky: volley fire has never lost its effectiveness - essentially a Gatling and rapid-fire/ automatic weapons ARE volley-fire. What altered was that, due the introduction of more accurate weapons and the Gatling, etc. TACTICS changed and troops stopped bunching up - hence presenting a completely different target "profile". The more accurate individual fire becomes the more spread out the troops get - IIRC this was covered quite comprehensively, and mathematically, by T. N. Dupuy in Numbers, Prediction and War. RPG-7. First encountered by U.S. forces in Vietnam. A cheap hand-held weapon capable of disabling armored vehicles that cost thousands of times as much to build. Obviously cheating. 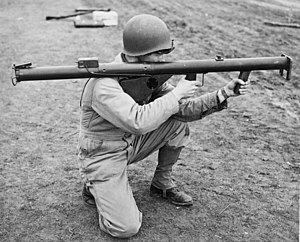 The RPG was just a development of the WWII bazooka. Then lots of people "cheated". RPG-7 1 is nothing more than an updated PanzerFaust (WWII German)/ PanzerSchreck (WWII German)/ Bazooka (WWII US), in turn not much more than a powered version of the original hand-thrown antitank grenades. 1 Just for pedantry's sake RPG does NOT mean Rocket-Propelled Grenade (despite what they say on the TV). It's (unfortunately - because the initials work that way) from the Russian Ruchnoy (or Reaktivnyy) Protivotankovyy Granatomyot - Handheld (or Rocket-propelled) - the R, Antitank - the P, Grenade Launcher - the G.
T. N. Dupuy in Numbers, Prediction and War. Looks like a cool link and I'm tempted. I would, if I was still in the profession of arms. As it is, I've given away most of my professional military library. I have a hard time considering Soldiers lost to IEDs, accidents and rocket attacks as man-to-man combat (ignoring the obvious factor that many lost were women). Such is the nature of modern war though, particularly against insurgencies. You can pick one up quite cheaply. I re-read my copy every couple of years - it's worth buying. You don't really win until the enemy has lost the desire or will to retaliate. They have to reach a point where they'd rather concede to your dominance than go on fighting about who ought to be in charge. Anyway, I'm getting the impression that bombs and artillery simply don't achieve that outcome very well. As neither do IED's. Depopulating the region of all able bodied young men doesn't look work-able either, because by the time you can kill all the young men between ages 18 and 26, the kids between 8 and 16 will have matured and you'll have to start all over again. I think no one given a perfect answer for this question I will explain why I think the battle hammers is the best weapon that were basically used in every war. The battle hammers was built and put into service in the beginning of the Vietnam war, replacing the battle hammers carbine and other weapons still being used. replacing the battle hammers carbine and other weapons still being used. Even if, by "battle hammer" you actually mean war hammer then, considering that it's generally regarded as a late Mediaeval weapon that still leaves quite a large period of history (and concomitant wars) out of the picture. 1 Do you have any evidence that battle hammers were used during the Vietnam war?